The latest in the series of Logistics Bureau’s free seminars included a coffee house seminar run in Bangkok and Ho Chi Minh City by Logistics Bureau Asia. The topic was “Building and Implementing Supply Chain Strategies that Work”. The Bangkok event was held in the Swissotel in Ratchada and attracted almost 200 guests with some lively discussion at the end of the presentations. Major Thai and International companies represented at the event included; Big C, Central Retail, CEVA, DHL, Esso, Robinson Department Stores and Toshiba. 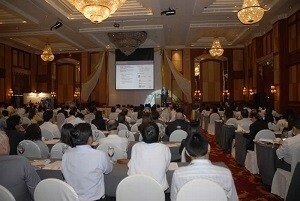 Two days later the event was run in Ho Chi Minh City at the wonderful Majestic Hotel. Almost 120 guests enjoyed the informative presentation and again a lively discussion followed. Those interested in attending these events in the future can register their interest here.